As dozens of bushfires continue to burn across the country (not least in New South Wales) many Australians find themselves unable to return home while many others have no home to return to. While we all rely on the media for information about imminent threats, it’s at the local level that some of the most valuable information-gathering is being done. 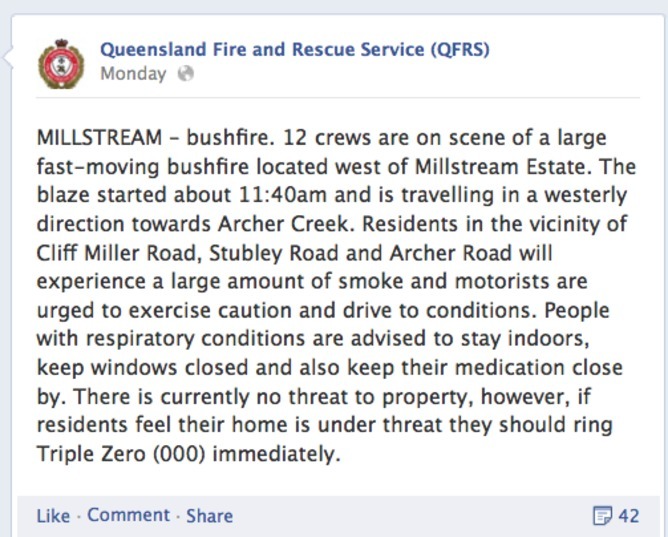 Local communities, and especially those who are at “the first mile”, are the first responders in the case of a bushfire: the people that take immediate action when danger is imminent and that provide crucial information as the event unfolds. 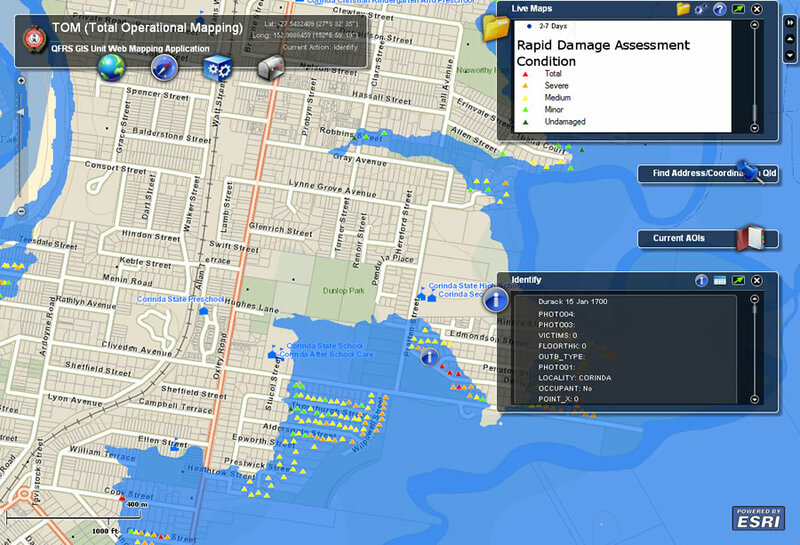 Accessing, managing, and sharing this ground level information is indispensable in all phases of the emergency management cycle. Increasingly, emergency authorities everywhere are providing warnings and updates about incidents via official web sites, social media accounts, and text messages. But in emergency situations, heavy usage of communication networks may cause traffic disruptions, severely compromising the delivery of updated information. Such disruptions highlight technical glitches under huge volumes of traffic. They also highlight the fact that we often wrongly assume credible information only travels in one direction: from authorities to citizenry. In the era of ubiquitous social media, linked open data, and kaleidoscopic conversations, where is the Plan B? If, as Ross Bradstock suggested on The Conversation, fire events “could also increase in environments where human exposure is greatest and most vulnerable,” locals will need to rely on locals as well. First responders can make a granular assessment of needs, resources to be pooled, and provide assistance to the most vulnerable or isolated people in the area. Current approaches, therefore, often involve a mix of technologies (such as SMS, mobile apps and so on) and collaboration between humanitarian actors, emergency response agencies, corporations, and citizens. When the end game is to save lives, collaboration is key to an effective and efficient response and can forge relationships that can continue post-response. A good example is the 2010–11 Queensland floods. 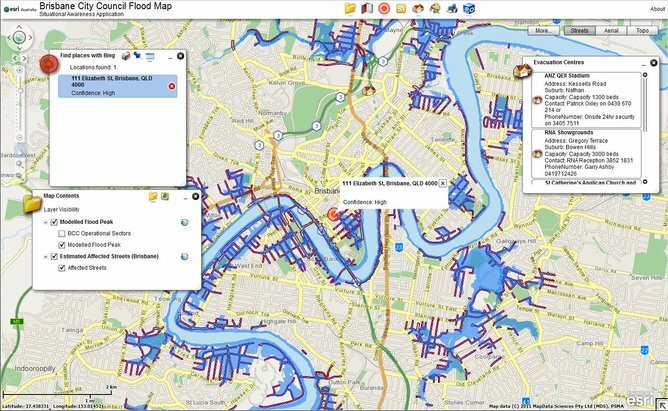 This emergency response saw a collaboration between Esri Australia, the Queensland Fire and Rescue Service (QFRS), and citizen volunteers to develop technology that visualised, in real-time, vital information such as flood peaks, damaged property, and road closures. In addition, information from social media feeds – crowdsourced tweets, Flickr photos and YouTube videos – were geolocated on the map, providing responders with another level of insight to what was happening on the ground. 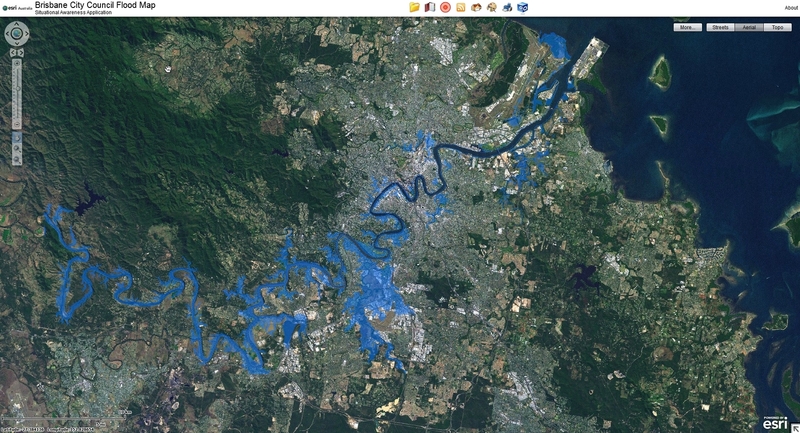 Brisbane was under water for four days at the height of the floods. During this time the flood map received more than 3 million hits. 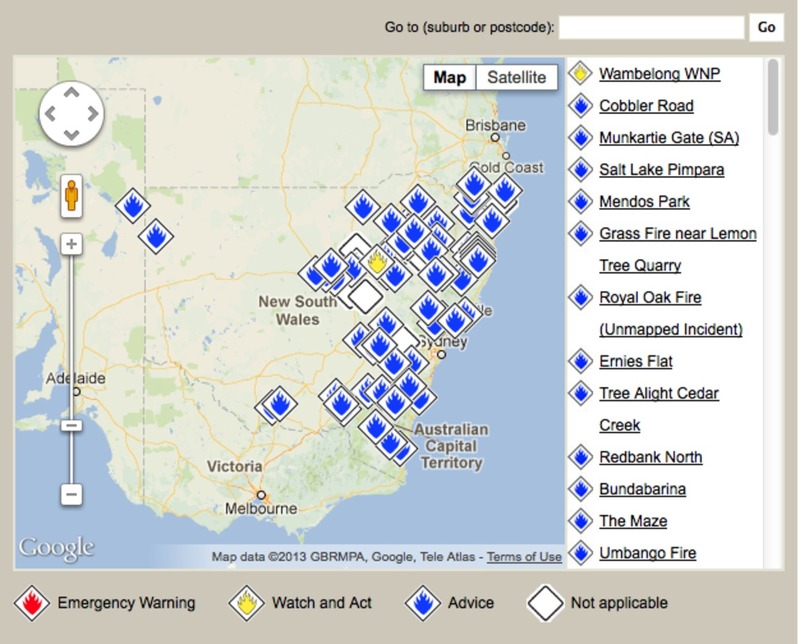 The technology used for the Brisbane floods (which was developed into the Total Operational Mapping (TOM) system – the solution operated with QFRS to visualise emergency data across the state), has also been used to help South Australia’s Country Fire Service (CFS) volunteers and to develop bushfire prediction technology used by Western Australian emergency responders. The fire prediction tool, developed by the University of Western Australia, predicts the path of a fire based on data such as vegetation type and condition, weather forecasts, and topography. 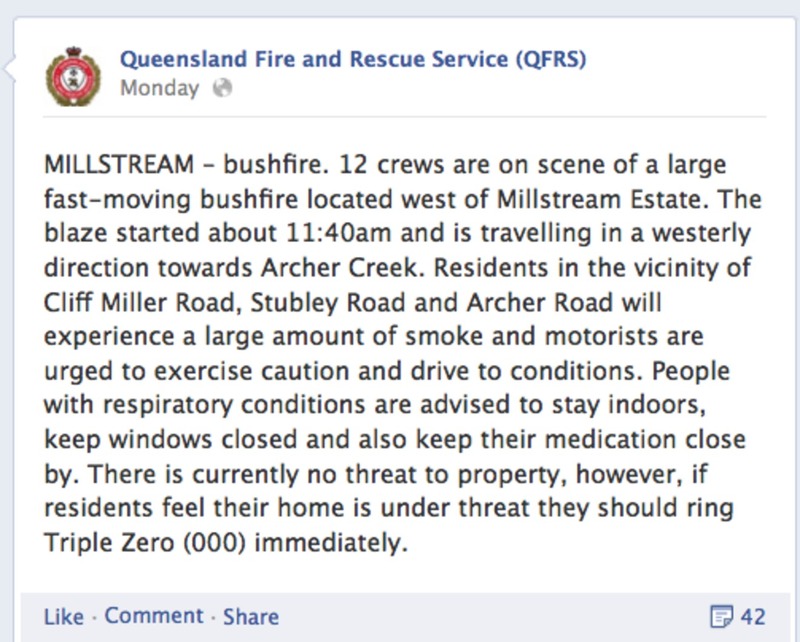 The results are then used by emergency services to help inform preparedness activities. The data are also accessible to the public via an early-warning website. In New York, Hurricane Sandy also fuelled a crowdsourced, people-centered approach to emergency management and recovery. The #OccupySandy movement, relying on the experience gathered in the days of Occupy Wall Street, established distribution hubs, transportation, first aid and medical supplies. Participants in #OccupySandy also partnered with other organisations and platforms such as Sahana (to manage requests and the dispatch of items, meals, volunteers and so on) and Recovers (a site allowing people to offer/request assistance). It might well be too early to assess the long-term impact and effectiveness of these crowdsourced, “horizontally distributed” initiatives. But such technologies will continue to empower citizens and local communities in building peer-to-peer disaster management networks that can come to the rescue when public agencies and large organisations are overwhelmed. This article was co-authored with Keera Pullman, Consultant – Professional Services at Esri Australia. This entry was posted in crisis mapping, crowdsourcing, mobile technologies and tagged Australia, bushfires, disaster response, technology. Bookmark the permalink.